I have listed a new property at 3530 33RD AVE W in Vancouver. I have sold a property at 2903 108 CORDOVA ST W in Vancouver. I have sold a property at 2918 13TH AVE W in Vancouver. A wonderful family home on a beautiful tree-lined street in the heart of the community of Kitsilano. There is a large open plan kitchen for getting together. A Family room plus spacious living and dining gives lots of space to be comfortable. There are French doors off the kitchen that open onto the cedar deck overlooking the warm and sunny South backyard. Everybody gets their own room with four beds upstairs. There is a den on the main and a two bedroom suite down. Rich walnut hardwood floors, European mosaic tiles, granite counters and stainless appliances. Twelve foot ceilings up and nine foot ceiling on the main. Easy walk and bike to shopping, parks, schools and the community center. Two car garage. YOU'LL LOVE IT! 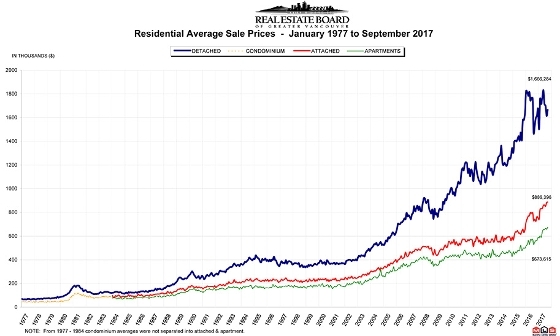 VANCOUVER, BC – October 3, 2017 – Apartment and townhome activity is outpacing the detached home market across Metro Vancouver*. This activity helped push total residential sales above the historical average in September. The Real Estate Board of Greater Vancouver (REBGV) reports that residential property sales in the region totalled 2,821 in September 2017, a 25.2 percent increase from the 2,253 sales recorded in September 2016, and a 7.3 percent decrease compared to August 2017 when 3,043 homes sold. Last month’s sales were 13.1 percent above the 10-year September sales average. There were 5,375 detached, attached and apartment properties newly listed for sale on the Multiple Listing Service® (MLS®) in Metro Vancouver in September 2017. This represents a 12 percent increase compared to the 4,799 homes listed in September 2016 and a 26.6 percent increase compared to August 2017 when 4,245 homes were listed. The total number of homes currently listed for sale on the MLS® system in Metro Vancouver is 9,466, a 1.2 percent increase compared to September 2016 (9,354) and a 7.5 percent increase compared to August 2017 (8,807). For all property types, the sales-to-active listings ratio for September 2017 is 29.8 percent. By property type, the ratio is 14.6 percent for detached homes, 42.3 percent for townhomes, and 60.4 percent for apartments. The MLS® Home Price Index composite benchmark price for all residential properties in Metro Vancouver is currently $1,037,300. This represents a 10.9 percent increase over September 2016 and a 0.7 percent increase compared to August 2017. Sales of detached properties in September 2017 reached 852, a 27.9 percent increase from the sales recorded in September 2016 (666), a decrease of 33 percent from September 2015 (1,272), and a decrease of 32.9 percent from September 2014 (1,270). The benchmark price for detached properties is $1,617,300. This represents a 2.9 percent increase from September 2016 and a 0.1 percent increase compared to August 2017. Sales of apartment properties reached 1,451 in September 2017, a 19.1 percent increase compared from the sales recorded in September 2016 (1,218), a 5.1 percent decrease from September 2015 (1,529), and a 22.1 percent increase from September 2014 (1,188). The benchmark price of an apartment property is $635,800. This represents a 21.7 percent increase from September 2016 and a 1.4 percent increase compared to August 2017. Attached property sales in September 2017 totalled 518, a 40.4 percent increase compared to the sales recorded in September 2016 (369), a 4.8 percent decrease from September 2015 (544), and an 11.6 percent increase from September 2014 (464). The benchmark price of an attached home is $786,600. This represents a 14.5 percent increase from September 2016 and a 1.1 percent increase compared to August 2017.